Of toasting flutes from the Red Cut Collection by John Rocha, featuring high-gloss deep red cased crystal with a dramatic band of intricate diamond cuts. Contemporary style and classic elegance. Hand-crafted of fine lead crystal by European master craftsmen with the weight, color and clarity expected of fine Waterford crystal. Tall and elegant, each flute stands approx. Will add color and beauty to any bar collection. A perfect wedding, anniversary or special occasion gift! Pictures may not reflect true colors due to various lighting conditions. 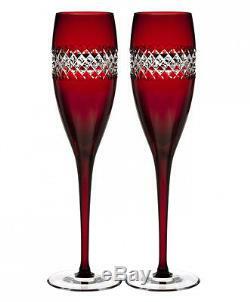 The item "Waterford John Rocha Champagne Flute Pair RED CUT Cased Crystal 40008456 New" is in sale since Sunday, April 3, 2016. This item is in the category "Pottery & Glass\Glass\Glassware\Waterford". The seller is "stop2shop18" and is located in East Brunswick, New Jersey. This item can be shipped to United States, Canada, United Kingdom, Denmark, Malta, Australia, Greece, Portugal, Japan, China, Sweden, South Korea, Indonesia, Taiwan, South africa, Thailand, Belgium, France, Hong Kong, Ireland, Netherlands, Spain, Italy, Germany, Austria, Mexico, New Zealand, Singapore, Switzerland, Norway, United arab emirates, Malaysia, Brazil, Chile, Colombia, Bolivia, Ecuador, Gibraltar, Cambodia, Liechtenstein, Luxembourg, Monaco.